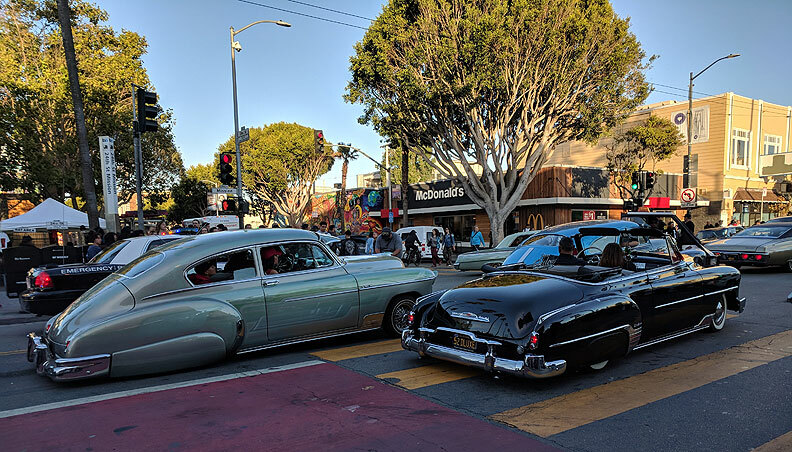 Low riders take over Mission Street on a summer day in July 2018. 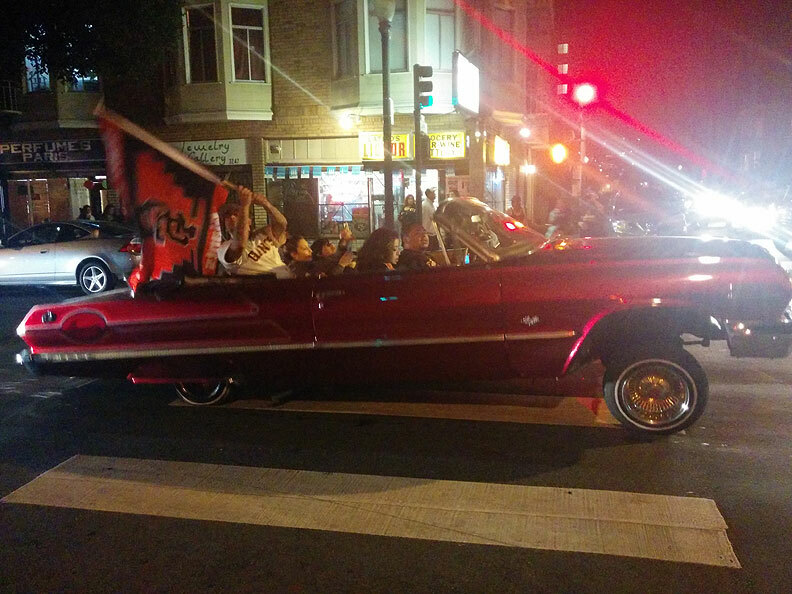 Low rider car out to celebrate the World Series championship of the Giants in 2014. Four years ago, I moved from the outer Mission district of San Francisco, to the lush, green wine country of Northern California. In short order, I acquired a 1952 Chrysler from a local surfer moving to Florida to “catch the waves man!” I purchased the “bomb” (as this type of car is commonly known amongst lowriders) dirt cheap. I just couldn’t pass it up. I was thrilled that my childhood dream was coming true. I immediately went out and bought some fuzzy dice and profile skirts to adorn my new beauty. I then went to work polishing the rusty hood ornament until it shined. As I started to boast about my new acquisition to friends and family, I noticed that the reactions I drew were diverse and sometimes startling. Some commented that it was a great deal, several of them gave me blank stares, others would say, “that’s cool”, and others wanted to get in and go cruising. Still others seemed confused and told me that I was “psychologically regressing”, going through the proverbial barrio midlife crises. Ouch! Could it be true I wondered? Is this what I’m going through? I then began to reflect on life as a member of the lowrider/cholo community. I began meeting other lowriders in town and attending meetings with the Sonoma Lowrider Council, an organization uniting many car clubs in the Sonoma County region. I came to realize that cruising and growing up in the lowrider-cholo culture was more than just hanging out and looking cool. I began to see that “this low-riding thing” was actually a modern form of mental and spiritual healing; a healing from centuries of intergenerational trauma. And that it also represented a communal resistance to acculturation. 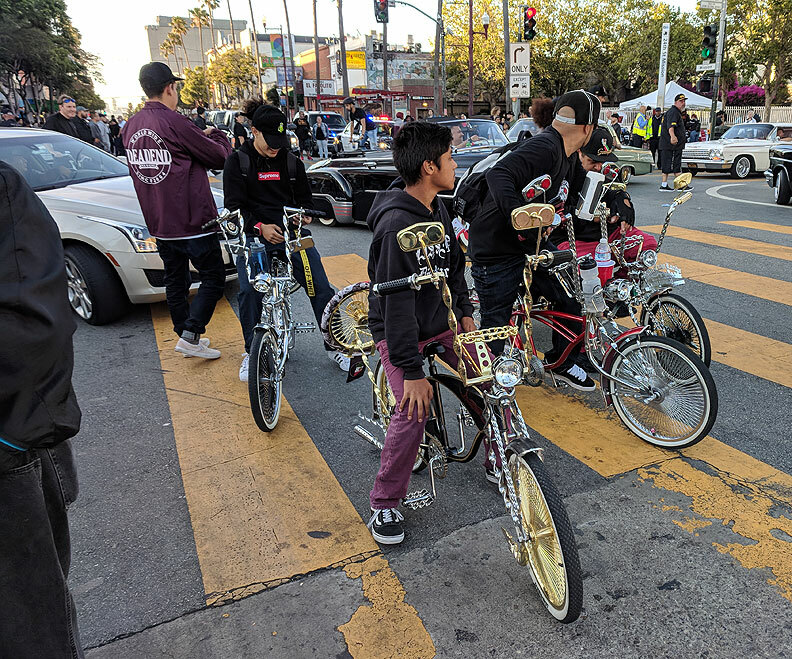 Growing up in the Mission and Excelsior Districts of San Francisco, I would cruise my lowrider bike, wearing colorful Pendleton shirts, a tape player strapped to the handlebars, blasting the oldies. I got my first tattoo at age 10, and if you can believe it, almost got kicked out of Catholic grammar school for painting 5-foot graffiti letters on the school that said, “Brown Pride!” At this time, I was an angry juvenile delinquent resenting the many incidents of discrimination my family and I had endured in our neighborhood. But in my early 20’s, I became a father, got sober, worked construction and went to school in the evenings, eventually attained bachelor and master’s degrees and now almost a Ph.D. I began to gather the academic/intellectual tools so I could more deeply understand the meaning of lowrider/Cholo culture; to understand my own experience. Low rider bicyclists, July 2018, Mission and 24th Streets. 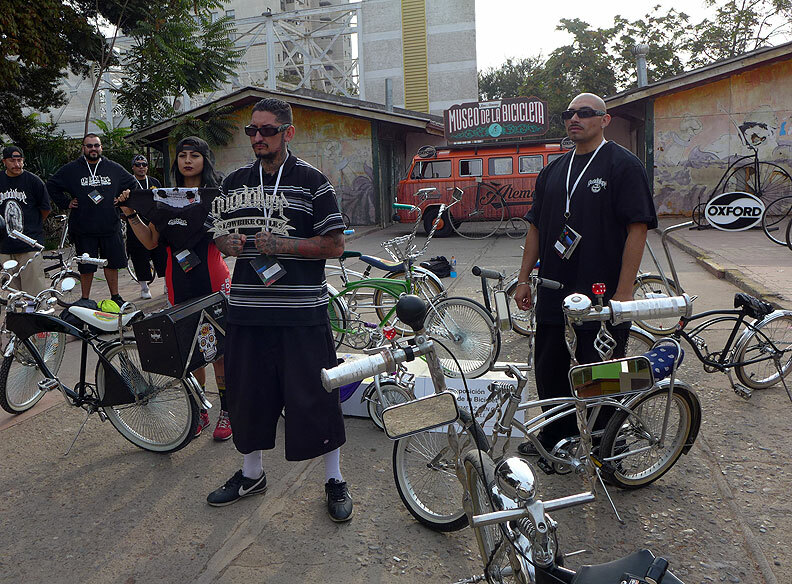 Chilean lowrider bicyclists at the World Bike Forum in Santiago, Chile, April 2016. In the late 1970’s and 80’s, the San Francisco Bay Area, like other places in California, was a mecca for lowrider and cholo styles, which had originated in Southern California and the Southwest. According to some scholars, lowriding culture came from the Pachuco zoot suit legacy of the 1930 and 40’s and expanded during the Chicano movement of the 1960’s. 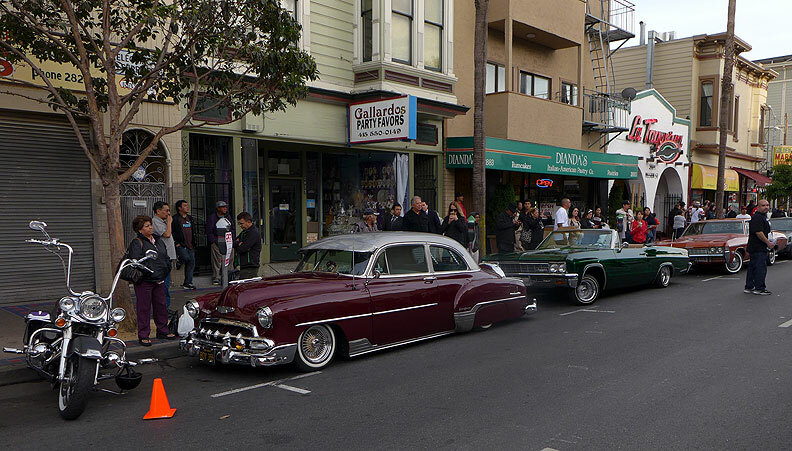 The first time I ever saw a lowrider was at age seven walking with my mom to buy tortillas at “Mi Rancho” supermarket, on 20th and Folsom Street in San Francisco. It was an amazing sight. This car was beautiful—dark-blue, with multiple white pinstripes down the sides, blue crushed velvet interior plus volcanoes and pyramids, painted on the trunk; Aztec warriors in full regalia on each of the car doors. These images sent a powerful message, validating my experience while pushing up against the sounds and sights of the dominant, socio-cultural “norms” I was taught in school and absorbed through the media. To understand lowriding and cholo styles as a form of self-healing, we must look at how ancestral indigenous forms of integral healing were and are being practiced throughout the U.S. A well-respected Mayan elder who currently lives in San Francisco, once told me, that the colorful, magnificent woven garments worn by indigenous communities in Central America and Mexico were not always worn traditionally. In fact, he said that the traditional huipil, or blouse, among the Maya for example, were actually very plain, white cotton prior to the Spanish invasion. The colorful attire used now, came after European contact to both identify individuals with the community of origin and to promote healing. According to Mayan tradition, putting on and wearing bright colors heals trauma not only for the person who wears those colors, but also for those who observe them. 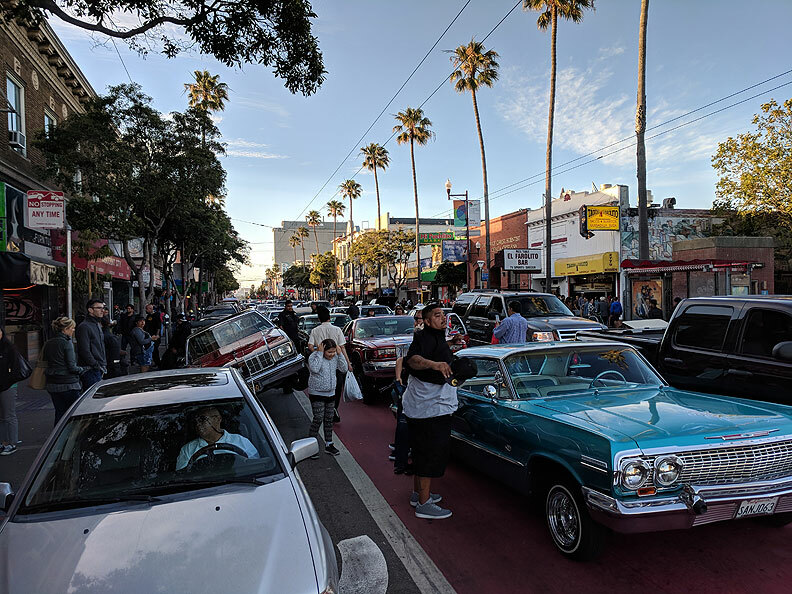 I believe there is a connection between this ancestral tradition and contemporary lowrider culture; the bright colors of the cars and Pendleton shirts, the art on bodies, on clothes, on the neighborhood walls; the music playing as you cruise. All of these elements are modalities for community identification, self-care and healing. Lowrider culture takes discarded old cars and turns them into objects of beauty; symbols of pride and identity. It remembers and reconnects us to our indigenous ancestors; painted on moving canvas’. It places the cholo-artist physically into these works of art; literally in the drivers seat. Like the huipiles, the colors reflect individual artistic expression and at the same time support community healing. If we look at the social controversies and issues associated with lowriding, such as gang violence, alcoholism and drugs use, we need to remember that these difficult problems exist in every community; and that, in part, these behaviors are manifestations of failed attempts by some of the most fragile members among us trying to heal intergenerational traumas by self-destructing through violence or medication (alcohol or drugs, legal or not.). Further, it should be noted that these behaviors are shared by many communities that have suffered fractured identities from the time of Columbus and even before. Renowned Western psychiatrist, Carl Jung, coined the phrase collective unconscious, which is, in a simplified description, a collection of unconscious memories and impulses that are embedded in the human psyche. Communities come together and make choices both unconsciously and collectively. This is passed along from person to person, generation after generation. Lowriding, for me, is a form of healing that springs from this collective unconscious. It rises out of a natural desire to resist oppression; to reclaim and maintain our sense of cultural identity. Our DNA cries out to express itself. 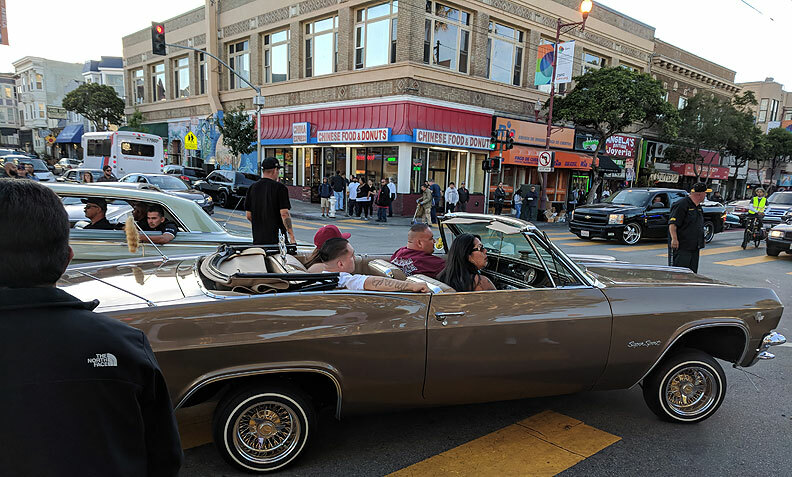 Lowriding disrupts the visual aesthetics of established “normality.” It proclaims the ongoing existence of the grandchildren and great grandchildren of the indigenous peoples of the Americas. The way we dress, speak, walk, create graffiti art and murals and drive cars was, and still is, part of surviving in a new culture; a way to push away the confusion, racism, self-doubt and self-denial of one’s own ancestral roots. The indigenous symbols we use on our cars and even on our bodies, are part of our collective memory. They are part of both our healing and our resistance. Despite societal issues of racism, poverty, trauma and violence, the lowrider community still stands strong, utilizing both traditional and modern means to heal body, mind and spirit. Cruising in their bright colorful cars is like Zen meditation, offering a sense of freedom from the trials and tribulations of daily life. In today’s reactionary atmosphere of hate and xenophobia, it is more urgent than ever for “La Raza” to maintain its ancestral pride, respect and love of self, than ever before. Today, I am the proud father of two children. I’ve got a good job, own an SUV, walk my dog, pay my taxes and even recycle. Who would have thought! And what I know is that the ancestors are with us, in our blood, our car paint, brims, the tattoos, wall murals, starched t-shirts and hydraulics. They collectively manifest in all of these modern-day forms to guide and lead us to a better tomorrow, freed from the loss of our true identities. Remembering who we truly are allows us to heal as individuals and communities. Lowriding feeds my soul. Lowriding forever! July 2018, all over Mission Street. Out to support a festival on Mission, parked across from the Mission Cultural Center. When out in the streets, the energy levels rise dramatically. 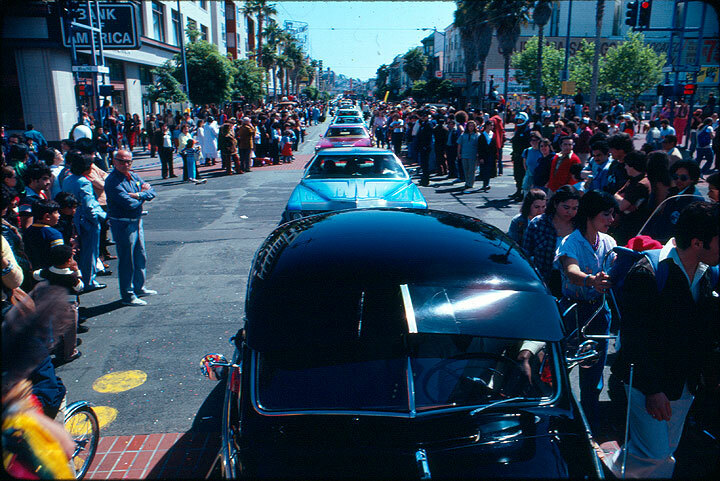 Low riders parade during early Carnaval, 1980.